Good for... Big fish thrills! Highlights Explore the seldom dived West End of Grand Bahama Island for a itinerary packed with sharks, dolphins, groupers as well as a myriad of schooling reef fish. Dive each day at the famous Tiger Beach! 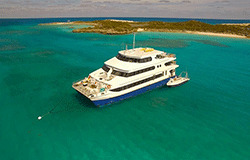 The following is a sample itinerary of dive sites we may visit during your liveaboard safari on board Bahamas Master. We wish to show you the very best diving possible, however, a number of factors can determine which sites we visit. Our Cruise Director and Diving Director, along with the Captain will take weather, tides, currents and many other factors into consideration to determine which route the yacht takes and which sites are selected for diving. Whilst we attempt to ensure the number of dives we have scheduled is fulfilled, bad weather can hinder the yacht's ability to reach a specified dive site in good time. The safety of all on board is paramount and we always do our best in offering diving at alternate locations should we be unable to visit those sites listed below. This itinerary involves some long distance (overnight) travel. Much of our diving in the Bahamas is comparatively shallow, which allows for 'open pool diving' after the scheduled baited/feeding dives until sunset. For your final day aboard we schedule two morning dives to allow plenty of time for off-gassing before disembarkation and your flight home. Guests are responsible for their own dive profiles and for obtaining suitable dive insurance to cover all diving activities. When visiting other islands, whilst we will always be on the look-out for the various species of shark calling the Bahamas home, these will be more traditional guided dives and, in some areas, after a thorough briefing, 'open pool' dives will also take place. Depending on weather conditions and where we are, we will always try to offer a sunset, or night dive. Guests should bring along dive lamps, though of course we have rental lights for those that need them! cliff that drops hundreds of meters into the blue abyss. The most famous spot for great hammerheads and bull shark encounters; best season is January-March. Bimini Road (Wall) plummets more than 1300 meters (4000ft) beneath the sea, alluringly claimed to be part of 'the lost city of Atlantis'. Whist most of the 'paving' stones are well hidden by powdery white sand being moved by the sometimes-strong currents, our guides will show you the areas and you can have a go at being an underwater Indiana Jones in uncovering these ancient stones. Hawksbill Reef runs roughly from North to South and parallel to North Bimini's shoreline. This stunning shallow (max. 15 meters - 50ft.) reef is made up of vibrant coral heads scattered upon an impeccably white sandy bottom. The main stars here are usually the reef's namesake - The Hawksbill Turtles resting on the bottom, but also expect to see angelfish, Bermuda chubs, French grunts, Creole wrasses and moray eels. The Berry Islands are located just 19 miles east of Bimini and 30 miles from New Providence. This chain of about 30 small islands is inhabited by just over 500 people. Here we will dive amongst the tiny cays where we are likely to see Caribbean reef sharks, black tip reef sharks, and eagle rays year-round. The months of November to March also bring chances of seeing tiger sharks, sperm wales, whale sharks, humpback whales and great hammerheads. The area is also well known for its turtle populations, being home to loggerhead-, green- and Hawksbill- turtles. It is from the Berry's that we first come into the 'Tongue of the Ocean' where depths drop to many thousands of feet. As well as taking in an array of marine life, we will also visit some stunning reef and awe-inspiring drop-offs into the abyss. Andros - the largest, yet most sparsely developed island of the Bahamas - is king when it comes to exceptional natural surroundings. Here, you'll find the world's third� largest fringing barrier reef, mesmerizing blue holes that some say are home to the mythical creature Lusca, the Tongue of the Ocean (a mile-deep abyss teeming with vibrant marine life) and numerous species of flora and fauna. From Andros we will explore the reefs running adjacent to the abyssal drop-off, and for those that are feeling brave, and with the appropriate training, we'll show you what it feels like to stare into the unknown at depths of more than 40m/130ft, from where the ocean drops to more than 6,000ft! A visit to the Bahamas also wouldn't be complete without experiencing a dive in one of the beautiful blue holes around the island, a land excursion to one of the blue holes will be a real highlight! Andros will also serve as our first real encounter with some impressive wrecks. We will visit a 200ft coral covered vessel in only 18m/60ft of water, allowing you to spend plenty of time on this special site. More shark action to enjoy at Shark Wall and Runway Wall, starring mainly Caribbean reef sharks but also stingrays, black and Nassau groupers and green-eyed moray eels. These sites can be dived shallow at around 35ft (10 meters). Nearby, the walls drop away, and you can see sharks swimming in the deep blue ocean. We will visit, amongst other sites, the simply stunning Razorback reef offering a range of diving from shallow 10m/30ft routes, and again, for those wishing to enjoy the view of the coral encrusted drop-off, you can venture down to the 40m/130ft plus mark. Whilst off the Southern tip of Nassau, we'll also visit numerous small wreck sites, including the famous 'James Bond' wrecks, as well as taking in the many conservation efforts around Nassau in the form of coral propagation. Weather dependent, we will sail to Big Major Cay for a day of R&R, a chance to degas, and take in some of the beautiful Bahamian sunshine, as well as swimming with the all famous pigs! Here you can swim and/or snorkel with the pigs that live on this uninhabited island. How the pigs got to the island remains a mystery to date. They are very friendly and used to humans, as they are fed by locals and tourists alike. They can drink from fresh water springs on the island. It is quite a unique and remarkable experience. A bit further north of Orange Creek is one of the best locations in the world to see oceanic whitetip sharks. Get up close and personal with these inquisitive and impressive pelagic creatures. Most dives will be in the blue of the open sea but the sharks tend to stay close to the surface. Please note, Cat Island is a considerable detour from our largely circular route in the Bahamas, we will only visit Cat Island when weather conditions are perfect during the months of June, July and August when oceanic white tip encounters are most likely. Scuba diving in Eleuthera and Harbour Island is world class. Devil's Backbone Reef is one of the greatest scuba sites in the world. In addition to the beautiful reef there are many shipwrecks not far off that are fantastic to explore. We'll typically explore the reef or shipwrecks, as well as Preacher's Cave or the famous current cut dive. The southern tip of Abaco is largely untouched, though there are a range of beautiful diving sites along the shoreline offering a range of depths and topographical features from reefs and walls, to marine caves and caverns. We will visit South Abaco as one of the final stops on our circular route of the Bahamas. 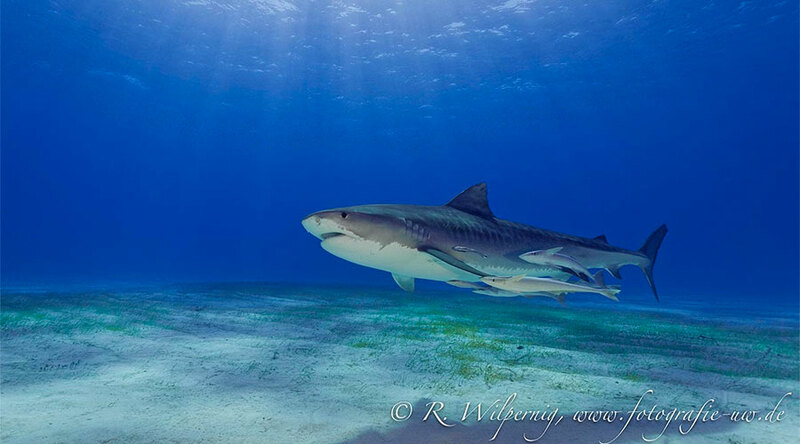 As our final stop, Tiger Beach is located off the West End of Grand Bahama Island and the best-known point for tiger and lemon shark encounters at a shallow (10-15m/33- 50ft) white sand bottom. This is the ultimate site for photographers and videographers. High chances of spotting great hammerheads, lemon sharks, Caribbean reef sharks, bull sharks and the occasional nurse shark. As well as being world famous for its crystal-clear waters and powdery, white sandy bottom, the Tiger Beach area is also home to a multitude of reef networks mini walls, and of course the continental shelf with drop offs to more than 2,000ft, though our average dives in these areas are no deeper than 30m/100ft. 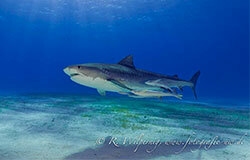 Dive the famous tiger beach for face to face tiger and lemon sharks!